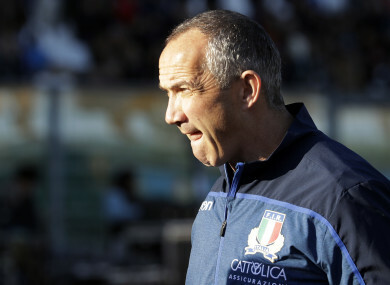 Italy head coach Conor O'Shea looks on at his side's clash with Australia. ITALY HEAD COACH Conor O’Shea was left fuming at a decision to disallow Tito Tebaldi’s first-half try as his side came up short against Australia on Saturday. Italy’s struggles in the second half were in stark contrast to an impressive start that saw them have two tries ruled out by the officials. Braam Steyn’s seventh-minute effort was scratched off due to his foot being in touch, but it was Tebaldi’s disallowed score soon after that angered O’Shea. The scrum-half intercepted a loose pass from the back of the lineout to race free and touch down under the posts, but he was denied the try as he was deemed him to have been offside. “I am very proud of the effort and behaviour of the boys,” O’Shea was quoted by Italian publication OA Sport as saying after their 26-7 defeat to Australia. “Perhaps if we had been more accurate we would have had a better chance, but I am proud because today is an important step for us towards the highest level. But I’m angry because we were denied the try of Tebaldi in the first half. When we play like that and we are not rewarded, I’m angry. “Would that change the game? I cannot say. Perhaps the result would not have changed but the mentality changed. Italy’s eighth defeat of 2018 extended their losing streak against the Wallabies to 18 matches as O’Shea’s side were unable to convert late pressure into points on the board. The result saw Australia get back to winning ways following their defeat to Wales last weekend. Email “'When we play like that and we are not rewarded, I'm angry': O'Shea fumes at disallowed Italy try”. Feedback on “'When we play like that and we are not rewarded, I'm angry': O'Shea fumes at disallowed Italy try”.